After sharing this tweet internally on our Socialcast group related to all things Apple, I came to learn that Yoann was not the only one running Production workloads on Apple Mac Minis'. It turns out, we at VMware also use Mac Mini's for a very special Production environment. This actually got me thinking about how other customers are leveraging VMware and Apple OS X in their environment? Would it not be cool to hear about how others leverage VMware and Apple Technologies together in their production environments? This was the primary motivation behind this blog series, the idea is to interview folks from the Virtualization community willing to share their experiences and educate the community on how they leverage VMware and Apple OS X in their Production environments. To help kick off this series, I would like to start off by sharing how VMware leverages vSphere and Apple OS X in our own Production environment. I got in touch with the person responsible for managing this environment and below is our chat transcript. [William] - Hi Michael, thanks for taking some time out of your day to share some information about how VMware uses Apple Technologies. For those that do not know you, can you introduce yourself and your role within VMware? [Michael] - Certainly. I'm Mike Lemoine, I've been at VMware for just over three years, and my title is Senior Tools and Infrastructure Engineer. I'm part of the Build/SCM team here, responsible for the care and feeding of the infrastructure that is used for VMware product builds. [William] - Build/SCM, that sounds pretty cool! So this is the Infrastructure that Engineering uses to compile and build out the various VMware (Apple) installers, executables and binaries that customers eventually consume? [Michael] - Yes, it is. While engineers can and do perform local builds on their desktops, or shared interactive environments, the only 'real builds' are the ones that go through this infrastructure. If it didn't go through our machines, it doesn't get released to the world. [William] - Sounds like a very critical piece of Infrastructure at VMware. So Michael, I heard from someone that you manage a very special build infrastructure at VMware and it involves some vSphere and Apple hardware? Do you mind telling us a little bit about this environment and what it is used for? [Michael] - I do, indeed! 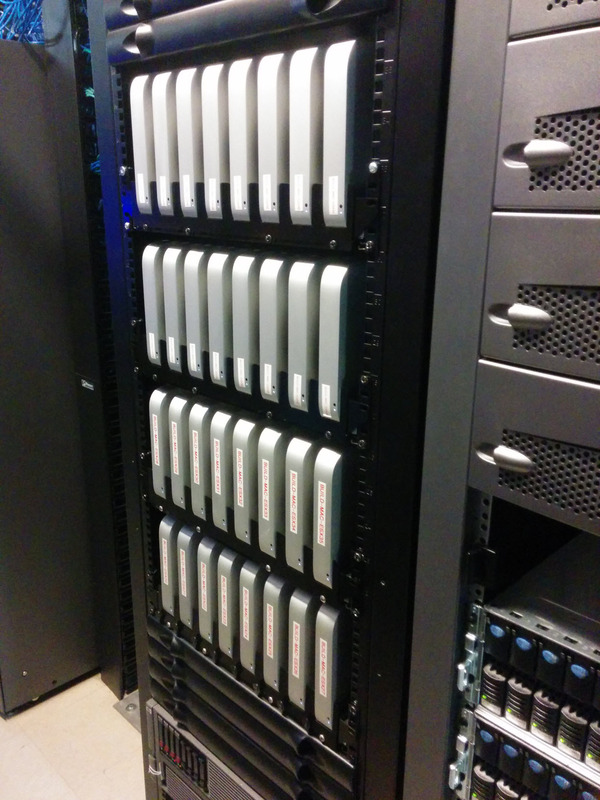 We have a fleet of Apple Mac Minis serving as the basis of our OS X build farm. While they're not on the HCL, they're really our best option for providing an environment for products intended to run on OS X or IOS. While the Mac Pro is supported, it has a lot of unnecessary equipment which makes it prohibitively expensive (well, wasteful) to use at scale. The Mini, on the other hand, has most of what we need. It's not perfect, but it's the best match we can accomplish without violating the Apple EULA. [William] - Wow, that is an awesome use case for the Apple Mac Minis! Even though the Mac Mini’s are not on the HCL, they are being utilized for Production workloads and building out products like VMware Fusion, Horizon View Client and iOS applications. Can you tell us a little bit more about the environment, number of hosts, version of ESXi and the amount of capacity it can support? Here is a picture of the Mac Mini Cluster in the VMware Datacenter. The rack that is used to hold the Mac Mini's is MMR-2G-5URS along with MMR-2G-2URS for brace stabilizer. [Michael] - We've got roughly 50 Mac Minis in production (a mix of 5,3 and 6,3 depending on when they were ordered), running ESXi 5.5. Each is stuffed full with the maximum supported config. In the case of the 6,2 minis that's i7 at 2.6ghz and 16G of memory. That's one of the lamentable issues with the mini, that it maxes out at 16G. We run two VMs on top of them, each taking their own spindle and 8G of memory. Our 6,2 minis are presently running 10.8.4 VMs, while the 5,2 minis are running VMs with older versions of OS X for build reproducibility. [William] - That is a lot of Mac Mini power! Are these ESXi hosts currently being managed by vCenter Server or are they managed individually? [Michael] Both, actually. Those ESXi hosts are all managed by vCenter, and our build system uses an in-house inventory and lease system to choose among available hosts. One of the reasons that we can confidently run these Minis in production is due to our automation being written for failure. We assume systems will be wedged, we assume every machine is a landmine. In reality, the Mac Minis very rarely give us any trouble, but knowing that we can lose nearly all of them and still produce builds gives us a sense of safety. [William] - That is a very cool solution. It sounds like the Mac Minis have been rock solid for our Production usage, but as a backup we still have intelligence built into our software so we can safely rely on the use of the “consumer” hardware. Sounds like a mini SDDC to me! Speaking of hardware failures, what components of the Mac Mini have you seen fail the most and how do you go about getting the parts replaced? [Michael] - Certainly. We're all about belts and suspenders; nobody wants that 2am call about a production outage. The issues we've had with the minis has been the death of the drives in them. These machines are very rarely idle, which is a usage pattern that the drives in them simply aren't prepared for. Amusingly, our support for the Minis is the same as anyone else's. One of the guys in our datacenter will pull the machine and take it to the genius bar, where they will tell us what we already know and replace the drive. The system will then be re-racked, the new drive set up as a datastore, and we deploy a new VM to that drive. Our Minis are all running ESXi off of USB sticks, so losing the drive isn't much of a hurdle. [William] - Ah, that’s cool that we’ve built that into the design and can easily tolerate host failures and rebuild is not really a big deal. So what about the VMs that were running, is there any data that needs to backed up and restored or is it stateless configuration? [Michael] - Nothing that needs to be backed up or restored. The systems are all configured via puppet, so all that's necessary is the base OS installation, which we have created a template for. The only manual step involved is running puppet the first time. Then we perform a test build to be sure everything is in order and put the system back into production. The total time a human spends on this once the system is re-racked is probably under ten minutes. [William] - Are there any plans in the future to upgrade the Mac Mini Cluster to using the new Mac Pro’s or do you see Mac Minis being more than sufficient? [Michael] - We've looked at the Mac Pro, but the extra cost of the dual GPU makes them expensive. If there was a Mac Pro option with cheap onboard video, we'd probably tolerate the inferior form factor and see what we could do for racking them. We still wouldn't have BMC, but we'd gain a gigabit network port. [William] On the topic of support, does the Mac Mini not being officially supported by VMware have any impact on you? [Michael] - The mac mini not being supported certainly has an impact on us. Our internal experience of support is already inferior to the customer experience. Having to fight the battle of "No, we don't support it, but we unofficially do" adds a cost to every interaction. [William] - My understanding is that the primary reason for not supporting the Mac Mini’s today is their lack of support for ECC memory. I know that our customers expect an Enterprise ready solution when we certify a platform, but in your opinion is this a requirement we potentially could reduce and do you feel customers would agree? [Michael] - I think that if we communicate the concerns to our customers and allow them to make their own decision on whether to take the risk of running consumer-grade hardware, it would be better for everyone. Customers would feel more secure with the off-label use, we already do the work in-house to make the Mini a usable platform, and the cost seems very low. I think the only challenge would be clearly enumerating the dangers. [William] - Michael, I really appreciate you taking the time and sharing with our customers on how VMware leverages the Apple Mac Mini’s for Production. Do you have any tips or tricks you would give to our customers looking at running vSphere on the Mac Mini for more than home labs? Are there any go to resources you would recommend customers to if they are looking to get started with running ESXi on a Mac Mini? [Michael] - My advice would be to follow our lead. Realize you're using consumer-grade hardware, and plan for failure. The low cost allows for easy redundancy, take advantage of that. In what other situation can you have an entire spare server on hand for $1200? While the information available on the internet is great, and I spent more than a little time on virtuallyghetto.com reading about mac mini attempts, I also had the ability to annoy and harass some of our talent inside VMware to get answers. To be honest, the amount of information you need in order to get ESXi running on a Mac Mini would probably fit on an index card. The challenge is hunting down which gotchas there are for your combination of ESXi version and mac mini revision. A KB article covering the few pitfalls in the process would be wonderful. Hopefully you enjoyed this first post in the series and stay tune for a couple other interviews that I am working on. In the meantime, if you are interested in sharing your story on how you use VMware and Mac OS X in Production, you can reach out to me here. It would be interesting to hear if Michael has done an analysis of external vs internal drives. Repair time on the most-frequently failing component would drop to minutes; in-chassis power consumption would drop so systems would run cooler and consumer-grade power supplies might laster longer, and overall throughput might increase due to drives faster than Apple’s consumer-grade offerings. I have to say, the 16 GB memory limit is all that’s enabled me to withstand the urge to have my own silent server farm of Minis. Maybe someday that will change. oops, new thread below rather than reply. I’ve given thought to internal vs. external drives, though mostly as thought experiment. If you denuded the mac mini as much as possible, pulling internal drives and reducing it to a chassis for memory and cpu, you’re going to then need to be able to push a lot of data outside the chassis to your storage. Your options become NFS datastores :(, an external disk/array/jbod, or a SAN. The single network port is already an occasional bottleneck (single 1Gb port on a network full of 10Gb devices), so you’re not going to want to do NFS datastores for that and other reasons. This also removes the SAN option, iscsi… Your external storage would then be connected by USB? Thunderbolt? Firewire? None of those are supported storage paths for ESXi datastores as far as I am aware. Stacking an unsupported storage solution on unsupported hardware would make it nearly impossible to get internal support. As much as I personally enjoy the imagined sight of a rack full of drive-free mac minis connected to some central storage like a set of slaves to a hive-mind, I decided that it wasn’t really in the cards at the moment. The closer to Frankenstein’s monster the solution gets, the harder it’ll be to maintain. With all of that said, I agree that the benefit could certainly outweigh the cost with the right setup, and I’d like to eventually have the time to POC a solution which removes the internal drives. There are many perks to my job, a surplus of time for proofs of concept isn’t among them. We’re using the Sonnet xMac mini 1U chassis with our Minis. It has a Thunderbolt to PCI bridge that allows us to provide 10GbE or Fiber Channel connectivity to our Mac Mini vSphere hosts. While not supported by VMware, it has worked seamlessly so far in our environment for at least the last 2 years.